Browns offensive coordinator Kyle Shanahan says that Robert Griffin III and Johnny Manziel are very similar, Jim Corbett of USA Today reports. “Johnny and Robert are very similar,” Shanahan said. “They’re both talented guys who can make plays with their legs. But there comes a time in the NFL when they’re going to keep you in the pocket, and you’re going to have to have that ability to make the throws with your arm and mind. 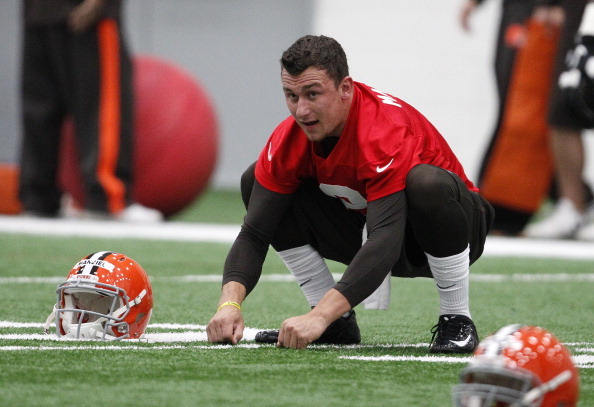 Manziel has been everything Shanahan had hoped. “Perception becomes everyone’s reality, but Johnny has been here working his tail off day and night, doing everything we ask,” Shanahan said. “He’s really attacked it every day, done a good job even as each week gets harder as we throw a lot more at him. “If he keeps working like he has been, Johnny should be feeling comfortable by the time we get to training camp,” Kyle Shanahan said. Manziel’s arm strength, accuracy on the move and adaptability to NFL coaching mesmerized Browns brass during a private workout at Texas A&M. “You have to have some special magic, swagger to you that you can get the job done,” Shanahan said. “And Johnny demonstrated that as good as anyone who’s ever played college football. And we think he’ll be able to carry it over.